Every summer the skin on my face seems to take a beating from the sun and weather. I know, I know I should take better care of it. The wrinkles on my forehead seem to be coming more prominent so when I got a chance to try Vine Vera, I jumped at it. 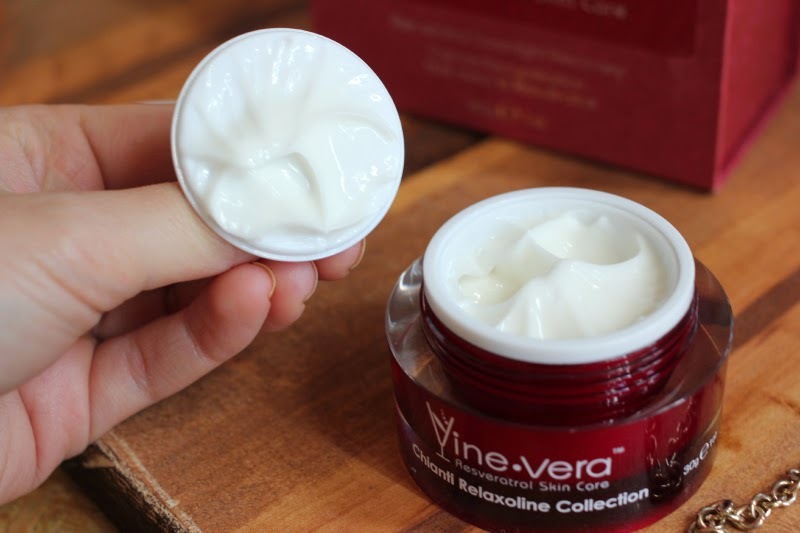 Vine Vera contains Resveratrol, is the antioxidant found in red grapes... yep, wine! 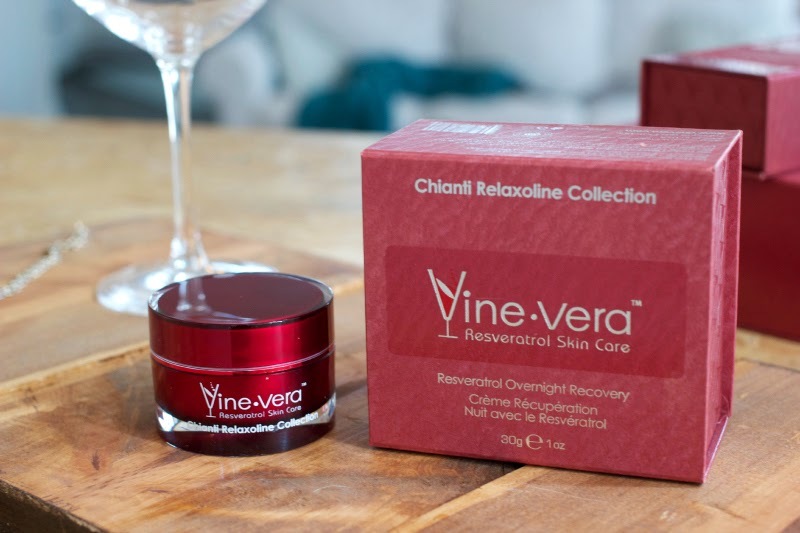 I tested out the Chianti Relaxoline collection, used to reduce wrinkles. I tested out the products for one month, night cream at night, morning recovery in the morning as well as the serum. So what did I think? Well...it was pretty great! I typically slather on Garnier Fructis lotion day and night, fancy I know, so this stuff was definitely a step up. After about two weeks of use I felt confident to walk outside with only a bit of make-up on and I'm hoping with continued use I'll be able to go make-up free. I loved that the morning after I used the night cream, my face didn't feel dry! With all wrinkle creams I've used in the past my skin immediately dries up and peels, I didn't experience any of those with these lotions. The consistency of these lotions is thicker than your drugstore brand, but it didn't leave a "thick" feeling on my skin. After a few minutes it had all but absorbed into my wrinkly forehead. There wasn't much scent to the serum or day cream which was nice, but the night cream did have a scent. It smelled mildly musky but with a hint of floral, I liked the scent and didn't think it was overpowering. So the real question, how are my wrinkles? Honestly, I don't think there is any quick fix to wrinkles and I probably won't have as smooth of a forehead as the Kardashians anytime soon, but I did notice my wrinkles didn't look as deep. They're still there, but less noticeable, was all I could ask for! 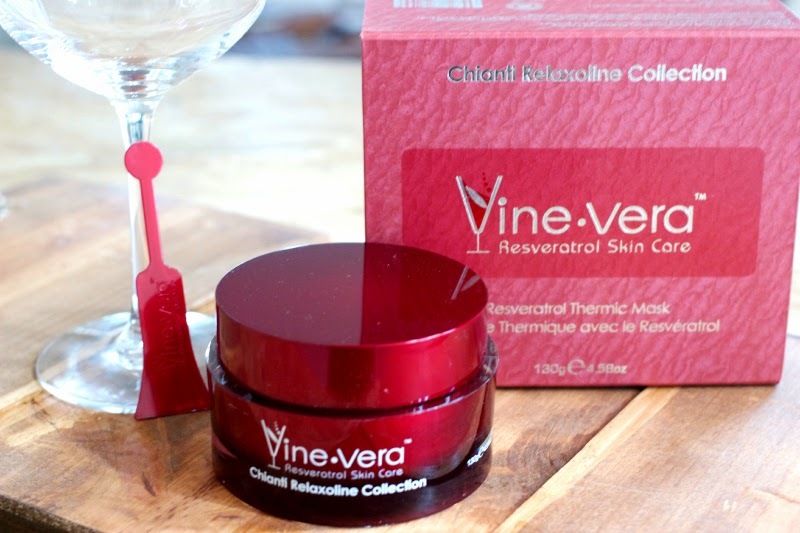 So why not give Vine Vera some love and enter to wine WIN the the Thermic Mask! Find out what other folks have to say about Vine Vera HERE or on their Facebook!